Brittney was raised in central Ohio and graduated from Dublin Coffman High School. She attended Cardean University where she earned her Early Childhood Accreditation. Brittney was a preschool teacher for five years before deciding to go back to school to become a dental assistant. 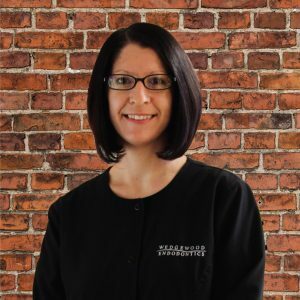 She graduated from The Ohio Institute of Health Careers, earning her Dental Assisting Diploma. She is certified in Radiology and CPR. Brittney happily joined the Wedgewood Endodontics team in 2010. When Brittney is not at work, you can find her spending time with her daughter or enjoying a good book.